Say hello to the Sizzlin' Chipotle Cheese Burger. Our Sizzlin' Chipotle Cheese Burger is a lot of sweet, tangy, cheesy, garlicky, oniony fun on a bun. Mix meat, onions and half the chipotle peppers just until blended; shape into 4 (1/2-inch-thick) patties. Stir remaining chipotle peppers into barbecue sauce. Brush half the barbecue sauce mixture evenly onto cut sides of buns. Grill patties 8 min. ; turn. Brush with remaining barbecue sauce. Grill 4 min. or until burgers are done (160ºF). 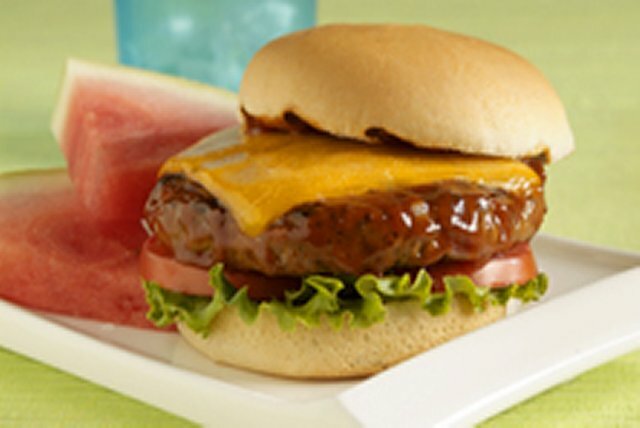 Top burgers with cheese and place buns, cut sides down, on grill grate; grill 1 min. or until cheese is melted and buns are lightly toasted. Make sure to wash hands and any surfaces well after handling raw meat.